December was a busy month for everyone, with holiday celebrations and wrapping things up for the new year I wasn’t the only one falling behind with this month’s read! But finish it I did on the very last day of the year. 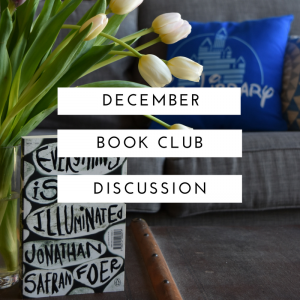 If you joined me in reading Everything is Illuminated let’s discuss it below! As always these questions are prompts, feel free to combine them, answer them in any order or simply share the thoughts you had about the book. What were your overall impressions of Everything is Illuminated? And star rating if you gave it one? How did you experience the book? Were you engaged immediately, or did it take you a while to get into it? Did you find the characters convincing? Were they believable, fully developed as complex human beings—or were they one-dimensional? What did you think of the style of narrative? In particular the two very different styles of ‘story’ (Jonathan’s quest to find Augustine and Brod’s life and descendants) plus the letters from Alex, making 3 distinct plot lines that ended up connected. Did you find the ending satisfying? If so, why? If not, why not. Did you have a favourite quote that stood out? What made it meaningful for you? Don’t forget to add a link to your review if you wrote one, or include your Instagram account name if you wrote a mini review there, so others can check it out. We’ll be reading The Knife of Never Letting Go by Patrick Ness in January, I hope to read with you again!